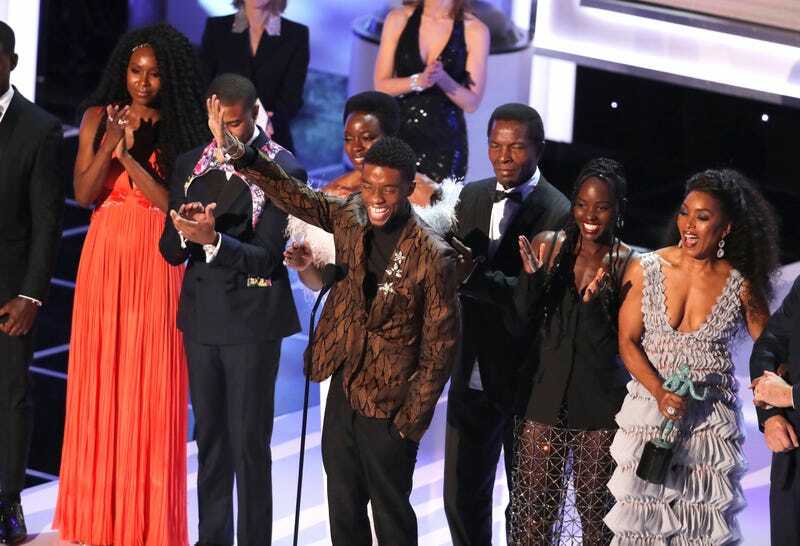 The cast of Black Panther accepts Outstanding Performance by a Cast in a Motion Picture, onstage during the 25th Annual Screen Actors Guild Awards on January 27, 2019 in Los Angeles, California. You thought Wakanda was kidding when it told y’all it’s forever?! Typically in anticipation of the Oscars, nominated films will do a marketing campaign with additional screenings or limited theatrical re-releases. Sometimes, that re-release occurs after they’ve won the golden trophy, too. It’s really the best way to get those “I’ve never even heard of this movie before but that Oscar buzz got me intrigued” butts in the seat. That’s not the case for Black Panther because everyone has seen it. Yeah them, too. And because Black Panther is not just a movie—it’s a moment—the hugely popular and successful billion-dollar maker isn’t doing the re-release the regular way. In fact, they don’t plan to make any more profit: it’s free. According to The Hollywood Reporter, 250 AMC Theaters across the U.S. will be hosting free screenings during the first week of February. Not only is that Oscars month, but it’s Black History Month. How fitting. Also, smart: the screenings will be right before the Oscar voting block opens. Academy members will be able to vote for their faves starting February 12 through the 19th. So, if you want to see Black Panther for the 50-leventh time, but this time, for free, get into this promo! Where: Your local participating AMC Theater in the U.S.
Why: Because you like nice things. How: Head to WeTicketIt.com for more info and to claim your tickets.